Not to be confused with Heterochromatin or Dichromatic (disambiguation). Heterochromia is a difference in coloration, usually of the iris but also of hair or skin. Heterochromia is determined by the production, delivery, and concentration of melanin (a pigment). It may be inherited, or caused by genetic mosaicism, chimerism, disease, or injury. It occurs in humans and certain breeds of dogs and cats. Heterochromia of the eye is called heterochromia iridum or heterochromia iridis. It can be complete or sectoral. In complete heterochromia, one iris is a different color from the other. In sectoral heterochromia, part of one iris is a different color from its remainder. In central heterochromia, there is a ring around the pupil or possibly spikes of different colors radiating from the pupil. Heterochromia is classified primarily by onset: as either genetic or acquired. Although a distinction is frequently made between heterochromia that affects an eye completely or only partially (sectoral heterochromia), it is often classified as either genetic (due to mosaicism or congenital) or acquired, with mention as to whether the affected iris or portion of the iris is darker or lighter. Most cases of heterochromia are hereditary, caused by certain diseases and syndromes. Sometimes one eye may change color following disease or injury. In sectoral heterochromia, sometimes referred to as partial heterochromia, areas of the same iris contains two completely different colors. It is unknown how rare sectoral heterochromia is in humans. Lisch nodules – iris hamartomas seen in neurofibromatosis. Ocular melanosis – a condition characterized by increased pigmentation of the uveal tract, episclera, and anterior chamber angle. Sturge–Weber syndrome – a syndrome characterized by a port-wine stain nevus in the distribution of the trigeminal nerve, ipsilateral leptomeningeal angiomas with intracranial calcification and neurologic signs, and angioma of the choroid, often with secondary glaucoma. Simple heterochromia – a rare condition characterized by the absence of other ocular or systemic problems. The lighter eye is typically regarded as the affected eye as it usually shows iris hypoplasia. It may affect an iris completely or only partially. Waardenburg syndrome – a syndrome in which heterochromia is expressed as a bilateral iris hypochromia in some cases. A Japanese review of 11 children with albinism found that the condition was present. All had sectoral/partial heterochromia. Piebaldism – similar to Waardenburg's syndrome, a rare disorder of melanocyte development characterized by a white forelock and multiple symmetrical hypopigmented or depigmented macules. Hirschsprung's disease – a bowel disorder associated with heterochromia in the form of a sector hypochromia. The affected sectors have been shown to have reduced numbers of melanocytes and decreased stromal pigmentation. Acquired heterochromia is usually due to injury, inflammation, the use of certain eyedrops that damages the iris, or tumors. Siderosis – iron deposition within ocular tissues due to a penetrating injury and a retained iron-containing, intraocular foreign body. Neoplasm – Nevi and melanomatous tumors. Fuchs heterochromic iridocyclitis – a condition characterized by a low grade, asymptomatic uveitis in which the iris in the affected eye becomes hypochromic and has a washed-out, somewhat moth eaten appearance. The heterochromia can be very subtle, especially in patients with lighter colored irides. It is often most easily seen in daylight. The prevalence of heterochromia associated with Fuchs has been estimated in various studies with results suggesting that there is more difficulty recognizing iris color changes in dark-eyed individuals. Acquired Horner's syndrome – usually acquired, as in neuroblastoma, although sometimes inherited. Neoplasm – Melanomas can also be very lightly pigmented, and a lighter colored iris may be a rare manifestation of metastatic disease to the eye. Parry–Romberg syndrome – due to tissue loss. Heterochromia has also been observed in those with Duane syndrome. Central heterochromia is an eye condition where there are two colors in the same iris; the central (pupillary) zone of the iris is a different color than the mid-peripheral (ciliary) zone, with the true iris color being the outer color. It is estimated that only 200,000 Americans have central heterochromia, around 0.01% of the population. Eye color is determined primarily by the concentration and distribution of melanin within the iris tissues. Although the processes determining eye color are not fully understood, it is known that inherited eye color is determined by multiple genes. 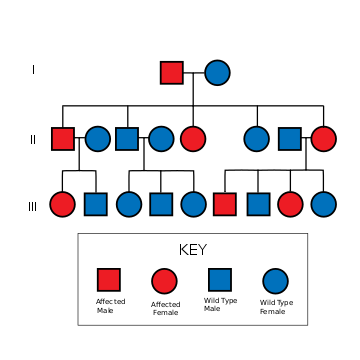 Environmental or acquired factors can alter these inherited traits. The human iris can be seen in a number of various colors. There are three true colors in human eyes that determine the outward appearance: brown, yellow, and grey. The amount of each color an individual has determines the appearance of the eye color. Central heterochromia appears to be prevalent in irises containing low amounts of melanin. A famous case of a person with central heterochromia was Baroness Rózsika Edle von Wertheimstein, whose daughter wrote: "She was a very beautiful woman... She had dark, dark brown eyes, but each eye had a purple ring to it, about a quarter of an inch of purple around these dark brown eyes." Although infrequently seen in humans, complete heterochromia is more frequently observed in other species, where it almost always involves one blue eye. The blue eye occurs within a white spot, where melanin is absent from the skin and hair (see Leucism). These species include the cat, particularly breeds such as Turkish Van, Turkish Angora, Khao Manee and (rarely) Japanese Bobtail. 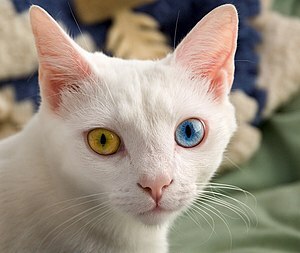 These so-called odd-eyed cats are white, or mostly white, with one normal eye (copper, orange, yellow, green), and one blue eye. Among dogs, complete heterochromia is seen often in the Siberian Husky and few other breeds, usually Australian Shepherd and Catahoula Leopard Dog and rarely in Shih Tzu. Horses with complete heterochromia have one brown and one white, gray, or blue eye—complete heterochromia is more common in horses with pinto coloring. Complete heterochromia occurs also in cattle and even water buffalo. It can also be seen in ferrets with Waardenburg syndrome, although it can be very hard to tell at times as the eye color is often a midnight blue. Sectoral heterochromia, usually sectoral hypochromia, is often seen in dogs, specifically in breeds with merle coats. These breeds include the Australian Shepherd, Border Collie, Collie, Shetland Sheepdog, Welsh Corgi, Pyrenean Shepherd, Mudi, Beauceron, Catahoula Cur, Dunker, Great Dane, Dachshund and Chihuahua. It also occurs in certain breeds that do not carry the merle trait, such as the Siberian Husky and rarely, Shih Tzu. There are example of cat breeds that have the condition such as Van cat. Actress Alice Eve has complete heterochromia: her left eye is blue and right eye is green. Actor Dominic Sherwood has sectoral heterochromia. Complete heterochromia in a teenager who also has anisocoria. Example of central heterochromia showing an orange to blue iris. Example of central heterochromia in green eye with speckled brown pigment. A young adult exhibiting sectoral heterochromia in the form of an orange segment in her right, blue eye. The individual's mother exhibited a similar orange section in her left eye, although her iris color was green. A cat with complete heterochromia. This cat's yellow eye has what looks like central heterochromia, as the outside of the eye is yellow, and the iris is green. 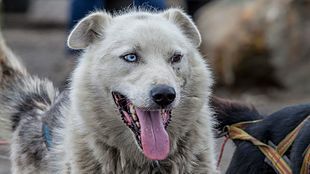 Complete heterochromia in a Siberian Husky: one eye blue, one eye brown. Sectoral hypochromia in a blue merle Border Collie. ^ Imesch PD, Wallow IH, Albert DM (February 1997). "The color of the human eye: a review of morphologic correlates and of some conditions that affect iridial pigmentation throughout life". Surv. Ophthalmol. 41 (Suppl 2): S117–23. doi:10.1016/S0039-6257(97)80018-5. PMID 9154287. ^ a b c d e f g h i j Loewenstein, John; Scott Lee (2004). Ophthalmology: Just the Facts. New York: McGraw-Hill. ISBN 0-07-140332-9. ^ a b Wielgus AR, Sarna T (December 2005). "Melanin in human irides of different color and age of donors". Pigment Cell Res. 18 (6): 454–64. doi:10.1111/j.1600-0749.2005.00268.x. PMID 16280011. ^ Prota G, Hu DN, Vincensi MR, McCormick SA, Napolitano A (September 1998). "Characterization of melanins in human irides and cultured uveal melanocytes from eyes of different colors". Exp Eye Res. 67 (3): 293–9. doi:10.1006/exer.1998.0518. PMID 9778410. ^ "heterochromia iridis - definition of heterochromia iridis in the Medical dictionary - by the Free Online Medical Dictionary, Thesaurus and Encyclopedia". Medical-dictionary.thefreedictionary.com. Retrieved 2014-04-27. ^ Swann P. "Heterochromia." Archived 2006-01-08 at the Wayback Machine Optometry Today. January 29, 1999. Retrieved November 1, 2006. ^ "Heterochromia: MedlinePlus Medical Encyclopedia". Nlm.nih.gov. Retrieved 2014-04-27. ^ "Heterochromia iridis". Genetic and Rare Diseases Information Center (GARD) – an NCATS Program. NIH. 8 April 2015. Retrieved 9 February 2019. ^ van Emelen C, Goethals M, Dralands L, Casteels I (Jan–Feb 2000). "Treatment of glaucoma in children with Sturge-Weber syndrome". J Pediatr Ophthalmol Strabismus. 37 (1): 29–34. PMID 10714693. ^ "Sturge-Weber syndrome: Definition and Much More from Answers.com". Answers.com<!. Retrieved 2009-11-19. ^ a b Wallis DH, Granet DB, Levi L (June 2003). "When the darker eye has the smaller pupil". J AAPOS. 7 (3): 215–6. doi:10.1016/S1091-8531(02)42020-4. PMID 12825064. ^ Ohno N, Kiyosawa M, Mori H, Wang WF, Takase H, Mochizuki M (Jan–Feb 2003). "Clinical findings in Japanese patients with Waardenburg syndrome type 2". Jpn J Ophthalmol. 47 (1): 77–84. doi:10.1016/S0021-5155(02)00629-9. PMID 12586183. ^ Brazel SM, Sullivan TJ, Thorner PS, Clarke MP, Hunter WS, Morin JD (February 1992). "Iris sector heterochromia as a marker for neural crest disease". Arch. Ophthalmol. 110 (2): 233–5. doi:10.1001/archopht.1992.01080140089033. PMID 1736874. ^ Liu CSC (August 1999). "A case of acquired iris depigmentation as a possible complication of levobunolol eye drops". British Journal of Ophthalmology. 83 (12). doi:10.1136/bjo.83.12.1403c. PMC 1722884. ^ Yang P, Fang W, Jin H, Li B, Chen X, Kijlstra A (March 2006). "Clinical features of Chinese patients with Fuchs' syndrome". Ophthalmology. 113 (3): 473–80. doi:10.1016/j.ophtha.2005.10.028. PMID 16458965. ^ Arellanes-Garcia L, del Carmen Preciado-Delgadillo M, Recillas-Gispert C (June 2002). "Fuchs' heterochromic iridocyclitis: clinical manifestations in dark-eyed Mexican patients". Ocul Immunol Inflamm. 10 (2): 125–31. doi:10.1076/ocii.10.2.125.13976. PMID 12778348. ^ a b Tabbut BR, Tessler HH, Williams D (December 1988). "Fuchs' heterochromic iridocyclitis in blacks". Arch. Ophthalmol. 106 (12): 1688–90. doi:10.1001/archopht.1988.01060140860027. PMID 3196209. ^ Bloch-Michel E (1983). "Fuchs heterochromic cyclitis: current concepts". J Fr Ophtalmol. (in French). 6 (10): 853–8. PMID 6368659. ^ Mehta K, Haller JO, Legasto AC (2003). "Imaging neuroblastoma in children". Crit Rev Comput Tomogr. 44 (1): 47–61. doi:10.1080/10408370390808469. PMID 12627783. ^ Genetic and Rare Diseases Information Center (GARD). "Heterochromia iridis". ^ Khan AO, Aldamesh M (June 2006). "Bilateral Duane syndrome and bilateral aniridia". J AAPOS. 10 (3): 273–4. doi:10.1016/j.jaapos.2006.02.002. PMID 16814183. ^ Shauly Y, Weissman A, Meyer E (May–Jun 1993). "Ocular and systemic characteristics of Duane syndrome". J Pediatr Ophthalmol Strabismus. 30 (3): 178–83. PMID 8350229. ^ Leonard, Jane. "Central heterochromia (two different eye colors): Causes and types". MedicalNewsToday. Retrieved 3 November 2018. ^ Seddon JM, Sahagian CR, Glynn RJ, Sperduto RD, Gragoudas ES (August 1990). "Evaluation of an iris color classification system". Invest Ophthalmol Vis Sci. 31 (8): 1592–8. PMID 2201662. ^ "Key Ocular Signs for Screening". Milesresearch.com. Retrieved 2009-11-19. ^ Misk NA, Semieka MA, Fathy A (1998). "Heterochromia iridis in water buffaloes (Bubalus bubalis)". Vet Ophthalmol. 1 (4): 195–201. doi:10.1046/j.1463-5224.1998.00036.x. PMID 11397231. Wikimedia Commons has media related to Heterochromia. This page was last edited on 13 March 2019, at 04:48 (UTC).